What dive destinations are there in Sabah? By Joanne Swann|2015-06-20T10:51:28+08:00June 23rd, 2015|Dive Kota Kinabalu, Diving Sabah, News|Comments Off on What dive destinations are there in Sabah? 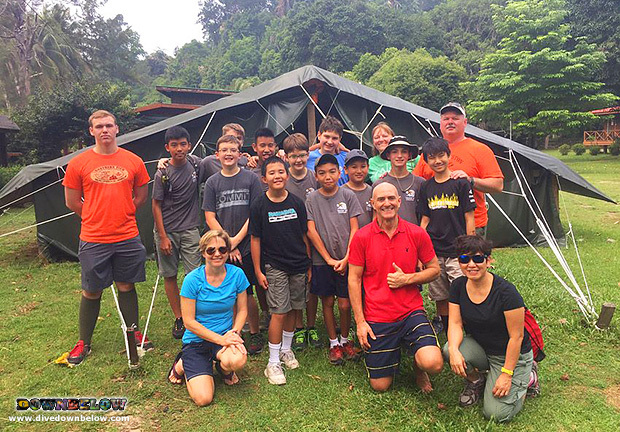 Downbelow teach SCUBA to the future of Sabah’s tourism industry! By Joanne Swann|2015-03-23T09:27:59+08:00March 22nd, 2015|Discover Scuba Diving, Dive Kota Kinabalu, Diving Kota Kinabalu, Groups & Schools, News, Sandakan Polytechnic, Sightings, Whale Sharks|Comments Off on Downbelow teach SCUBA to the future of Sabah’s tourism industry! No place like Kota Kinabalu, Sabah, to study marine biology! By Joanne Swann|2015-03-11T13:25:02+08:00March 10th, 2015|Courses, Diving Kota Kinabalu, News, Tunku Abdul Rahman Park|Comments Off on No place like Kota Kinabalu, Sabah, to study marine biology! Downbelow guests ‘game enough’ for Walk the Torq via Ferrata! By Joanne Swann|2015-02-28T09:50:18+08:00March 2nd, 2015|Climb Mt Kinabalu, Diving Kota Kinabalu, News|Comments Off on Downbelow guests ‘game enough’ for Walk the Torq via Ferrata! Luxury diving holiday: Only in Sabah with Dive Downbelow! By Joanne Swann|2015-02-12T09:41:18+08:00February 10th, 2015|Advanced Open Water Course, Diving Kota Kinabalu, Diving Sabah, News|Comments Off on Luxury diving holiday: Only in Sabah with Dive Downbelow! Facilities for clients of Downbelow’s 5 Star Dive Centre! By Joanne Swann|2015-01-12T12:15:44+08:00January 13th, 2015|Dive Kota Kinabalu, Diving Kota Kinabalu, Tunku Abdul Rahman Park|Comments Off on Facilities for clients of Downbelow’s 5 Star Dive Centre! Experience lux at Gayana Island Resort and adventure at our Dive Centre! By Joanne Swann|2014-11-07T12:25:35+08:00November 10th, 2014|Discover Scuba Diving, Dive Kota Kinabalu, Diving Kota Kinabalu, News, Tunku Abdul Rahman Park|Comments Off on Experience lux at Gayana Island Resort and adventure at our Dive Centre!